~Mrs. Mathis' Homeroom~: On the TPT Eh team! On the TPT Eh team! If you were in Vegas this week, you may have noticed this design on a few buttons, proudly worn by some Canadian TPTers! Unfortunately, I wasn't able to make it to the conference this year, but mark my words, I will be there next year! 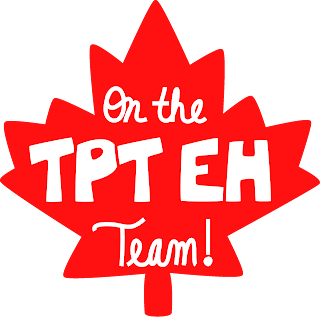 In the meantime, I thought it would be fun to host a linky with all of our great Canadian TPT stores, seeing as we're such an amazing team! Psssst....we get our own meetup with TPT in the Greater Toronto Area in a couple of weeks! I am so incredibly excited! I finally get to meet a lot of the other members of the TPT Eh Team! If you are Canadian and have a store on TPT, feel free to link-up! Thank you so much for the link up. I wasn't able to got to Vegas either this year but I WILL be there next year! What an awesome collection of sellers!! Canadians Unite!! This is amazing! What a great to easily direct buyers to Canadian stores! Thanks so much! I'm so sad that I didn't see this link up earlier! But at least I have found so many other awesome TpTers to follow! Thanks for sharing!